Most people find this plant fascinating - it's not often that you get to see a plant producing its young right on the edge of its leaves. 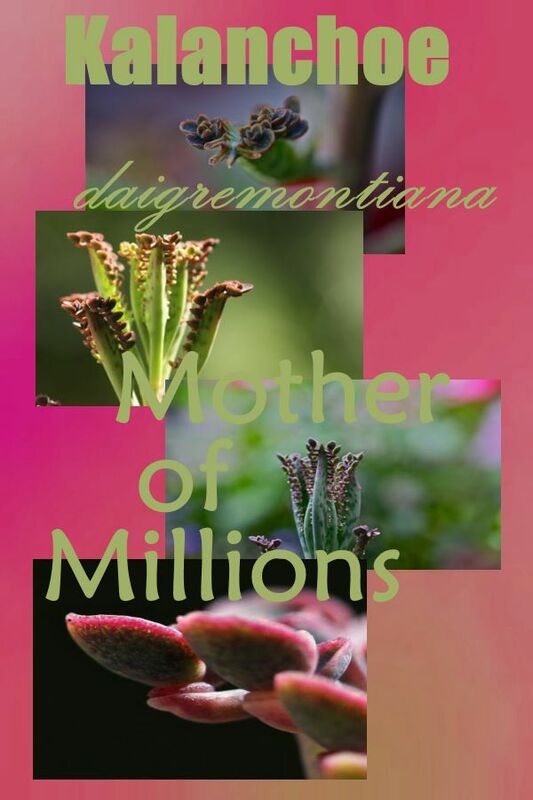 Kalanchoe daigremontiana, the Maternity plant, or Mother of Thousands (or millions) is one of the few that do this. It's known as vivaparous, or live bearing, and the tiny plants are exact duplicates of the adult plant, but much smaller. Once the baby plants reach a certain size and have a few sets of leaves, they will also have some roots waving around in the air. 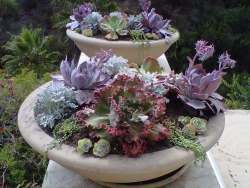 This is right about the time that they drop to the ground to root into the mother plants pot, or any adjacent planters. They can also live without any soil at all, or in a crack in concrete. 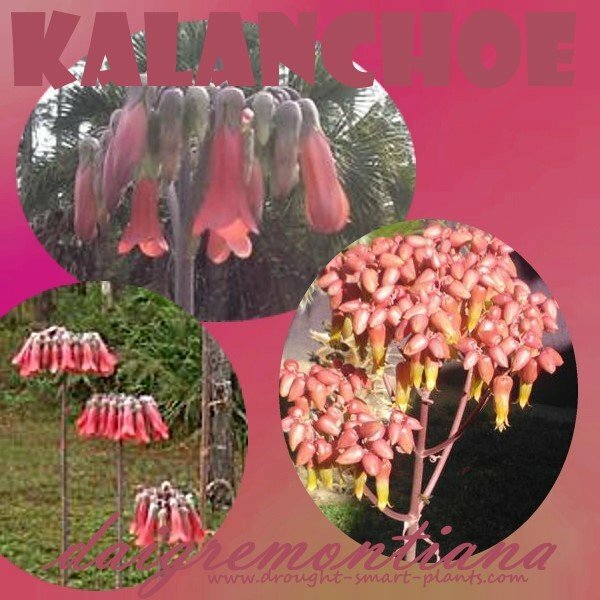 Many people have this plant, but few know its name, or some of its other characteristics. The leaves are opposed, meaning that it grows two leaves opposite to each other, and they are spear shaped, mottled or spotted with a dark maroon or purple on the back, and sometimes also seem to have a powdery substance called 'bloom' all over the leaves and stems. 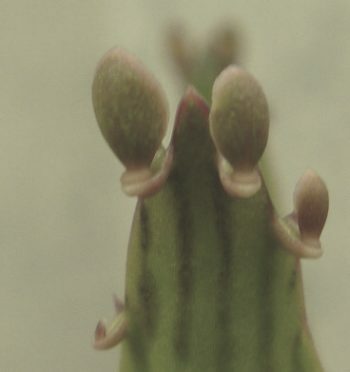 This picture shows how the new plants emerge from the edges of the leaves. There are several forms of this plant, with several variations. Some of these differences are genetic, others are the result of differences in growing conditions. In places like Florida, or in its native Madagascar, it's considered a noxious weed, and if it escapes from captivity, will proliferate by dropping the little plants all over the place. It can grow anywhere, in any conditions, especially if it's warm and humid. This is a plant that will most likely survive long after civilization ends. Please keep it in check if you garden in a warm climate. Besides the weird characteristics of the foliage, it has the most amazing flowers. These are generally in shades of pink and orange, arranged in a whorl of many down facing trumpets on a tall spindly stem. There is nothing in in the plant that would indicate that it could possibly have flowers like this, so it's always a surprise. Other things to keep in mind are that it is poisonous. Many cats especially seem to find it hard to resist. Is it the dangly little plants that entice them to chew on it? Or some other mysterious attractant that only cats know about? Keep it away from small pets and children. Find out more about other Poisonous Succulent Plants here. has thin flat leaves end close to stem curls up, has little ones that form off end of leaf. Variegated leaves, almost perfectly symmetrical pattern. Leaves seem to be shaped to channel water to the base of the plant.